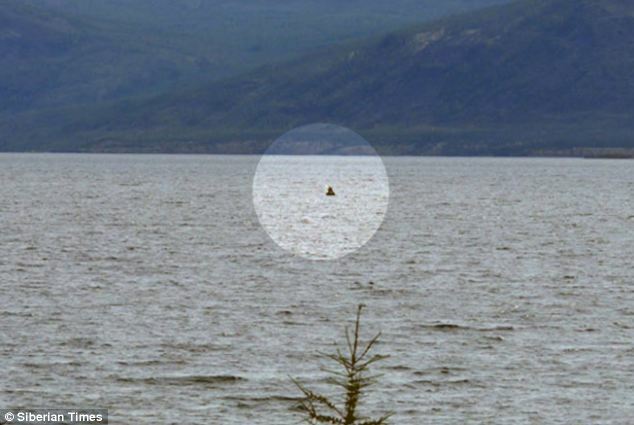 The media is running a story originally from the Siberian Times about a monster in Lake Labynkyr (Labinkir) in Russia with a photograph of a strange looking object and some sonar traces. The lake itself is located about 60 kilometres south of the town of Oymyakon in the Oymyakonsky District in Sakha, Russia and is a lot smaller than Loch Ness at 5 by 3 kilometres with a depth of about 60 metres. Though an abundance of fish is suggested, the freezing location of the lake implies it is not the most fish rich environment. The remoteness of the region also offers the possibility of things as yet undiscovered though unlike my four hour drive to Loch Ness, this is more like a four day trip! Like Loch Ness, it is claimed that the lake never freezes over. I didn't find the date, time or other details for the photograph, but it looks vaguely like a man in a boat and there is not much more you can say about it (but one presumes there were other pictures). The odd thing though when blown up is the distinct impression that there are two circular objects on the surface with one similar circular object on top. The object appears to be at rest on the surface as there is little water disturbance. The sonar picture below is interesting but the quoted "scientists" who drew a comparison beast on the screen must have realised that was a nonsense exercise since the sonar trace is a sequence of sonar returns built up over time rather than a snapshot image. Either they were not as qualified as we are led to believe or their PR man was getting a bit carried away. 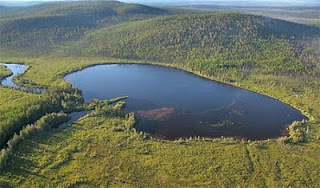 There is also another monster lake nearby by the name of Lake Vorota and Russian cryptozoologists have mused whether there is an underground tunnel linking the two bodies of water. Once again, this sounds a lot like the fabled link from Loch Ness to the sea. 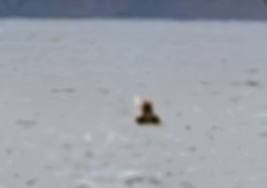 So the picture of "Nesski" itself, in true lake monster tradition, does not give much away but the shape of the object reminded me very much of a Loch Ness Monster sighting made back in 1933 by a man called Kirton. When Rupert T. Gould went to Loch Ness in 1933 to investigate this new creature, he interviewed various witnesses - including Dr. Kirton who sketched the object below. His sighting was of a hump like object off Knockie on the 14th November 1933 at about 3pm. He witnessed the object from Fort Augustus so the object was over a mile away but was sending out a "considerable wash" on each side. The presumption is he was viewing the creature rearwards and the head was the portion visible and further ahead, but we indulge in speculation. The two images are merely similar and no more and though Lake Labynkyr has a lake monster tradition, what the photograph shows is a matter of debate. Text below (these items can vanish forever from the Internet after some weeks/months. Best to read original with its pictures here). SO IS THERE A LOCH NESS MONSTER IN SIBERIA? A Moscow scientist is calling for a new scientific expedition to solve the mystery of a huge 'monster' claimed to be living in remote Lake Labynkyr in Siberia. 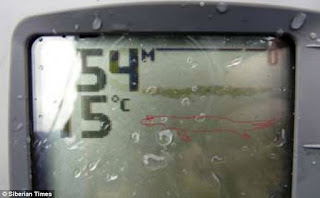 Is this the Siberian Nessie...? Known as 'Russia's Loch Ness Monster', the accounts of the creature in Yakutia predate the Scottish claims yet in many ways are similar. Intriguingly, too, there are theories that Labynkyr - which has unusual cracks on its 60 to 80 metre deep floor - is connected by underwater channels to another lake, Vorota, where monster sightings have also been recorded, including by respected Soviet geologist Viktor Tverdokhlebov, an academician not given to hyperbole. Associate Professor of Biogeography Lyudmila Emeliyanova revealed to The Siberian Times that on her own scientific mission to Labynkyr she recorded 'several seriously big underwater objects' with sonar readings. She is not the only researcher to have done so. 'It was our fourth or fifth day at the lake when our echo sounding device registered a huge object in the water under our boat,' she said. The readings were repeated and she became convinced there was more than one large living object in the pure waters. 'I can't say we literally found and touched something unusual there but we did register with our echo sounding device several seriously big underwater objects, bigger than a fish, bigger than even a group of fish. 'This is why I fully support the idea of a new trip there and extra research. Freshwater Labynkyr, some 5,000 km east of Moscow, is mysterious for another reason, too. It is only around 60 kilometres from the settlement of Oymyakon - the coldest inhabited place on Earth - yet, astonishingly, the lake does not freeze over completely in winter, in contrast to virtually all lakes in the region. The ice that does form, unusually, can be too thin to walk on. It is not uncommon to driver cars on lakes in Yakutia in winter: but not Labynkyr. One unproven theory is that Labynkyr, where much of the rock is volcanic, is warmed slightly from below by a fissure in the Earth's crust. Dr Emeliyanova, from the Biogeography Department of the Geographical Faculty of Moscow State University, is struck by historical accounts of monsters in Labynkyr and Vorota and believes they are credible. They date from the late 19th century, while accounts of the Loch Ness monster are usually held to have emerged in the 1930s. On the basis of 'sightings' there has been speculation that Labynkyr and Vorota might be inhabited by a school of ichthyosaurs, prehistoric marine reptiles resembling dolphins or sharks, or plesiosaurs, a popular theory concerning 'Nessie' in Scotland which is often depicted with a long neck. Another version has speculated that relic killer whales could have become marooned in Labynkyr. Some accounts even suggest the 'creature' makes a hideous primeval cry as it attacks its prey. 'Personally, I do believe that when the information about something strange circulates among local people for so many years, it just can't be groundless, it means something is there,' she said. 'I know the local people very well - they are ingenuous but they do not lie,' she said previously. For her another factor is how the stories of monsters in Yakutia relate solely to these two lakes out of more than 800,000 across this giant region. Even so, she insisted of her 2002 trip: 'I did not go there to chase the lake monster: as a biogeographer I was interested mainly in that very territory, I wanted to visit and study it. 'But, of course, I was curious to see the place which has so many legends and stories. I did not suppose we could really find something there simply because we did not plan to spend there enough time. Our stop by the lake was just for 12 days. 'As a scientist I know this is not enough to locate and study some unknown creature. I can put it like this, however. I believe there is a mystery in this lake because there is no smoke without fire. 'I am sure that numerous legends which exist and circulate for many years just can't be groundless. I read many different legends but the account below is what I heard with my own ears. 'Several fishermen who visit this lake from time to time say they experienced the following when fishing from a boat in this lake: during quiet, and not windy, weather when there were no disturbances in the lake, some strange waves coming from under the water suddenly heavily shook their boats. She explained: 'These stories shook me up, for instance, about a boat which was lifted by something or somebody. Two fishermen were fishing in the middle of the lake in late Autumn, they were in a 10 metre long boat when suddenly the bow began to rise as if somebody was pushing it from under the water. Another account of an entirely separate trip to the lake in August 2006 - where researchers used a Humminbird Piranha MAX 215 Portable fish-finder - produced results echoing her findings. Images are available from this trip - some are shown here - but the identities of those who took part are hidden. 'The conditions were ideal - clear cold fresh water, no big waves, stone bottom without plants there, no engine on the boat, soft and slow moving - all this means there were almost no problems for the scanning,' claimed one of those present. 'Often the device showed the long chain of big fish some 4 meters above the bottom of the lake, when the depth was about 30-45 meters. 'The further we went away from the shore, the deeper the lake was, at one moment there was no fish registered for a long period long, the screen was dead. But all of a sudden it blew up with signals about a huge shoal of fish, just like a cloud. 'Let me say a word about local fish - all kinds of fish here are predators, the bottom of the lake is 'dead', stones with sand, very cold near the bottom, no plants. Fish-predators just cannot swim all together making such a huge shoal, anybody familiar with Zoology will understand what I mean. 'This is why it meant nothing else but the huge swimming object with some air inside. 'We went twice above the object, it was at the depth of 30 metres (where the floor was 50 metres below). The upper 'fish' was at a depth of 25 metres, the lower 'fish' at 32 metres. It suggests the object was seven metres wide. What was it? We can't say. 'I switched off the 'Fish ID' and we watched just pure scanning.....soon we registered a 'shadow' some 15-17 meters under our boat, it was about 6.5 meters long. It was pretty clear, it was not a fish and not a tree. There cannot be fish that big, and a log would have been registered in a different way. How can it swim under the water? 'The next shadow; the width of the object is about 70 cm, and although the screen shows its silhouette differently to how we imagined, my mind vividly paints a picture of a beast, swimming across the echo device scanning ray. 'Another object was 'caught' at the depth of 20 meters. It was definitely a live creature - look at the density! - but of a smaller size, like 2.5 meters. Pictures here show the some of the images seen on the scanning device, including sketches (drawn on the screen in red) to show how the 'monster' might look. 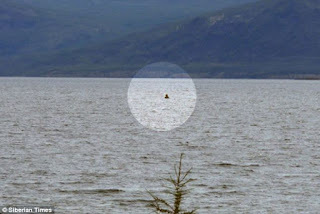 On another amateur trip to explore the lake, in 2000, Russian traveler Vladimir wrote: 'There was a signal from our echo sounding device, something was moving around our net with fish, something very big, seven to ten meters, it is hard to say because we did not know the speed of the object. 'There were interesting trails on the water as if something big enough is swimming not very deep and playing in the water... There is a strange island there. It is in the middle of the lake and lots of broken nests of the sea gulls. The gulls were just crushed alive when they were asleep and did not have a chance to fly away. Some birds were eaten, some just left there... Who did it? In the 1960s, there are accounts of 'a monster with a long neck coming up out of the lake making an eerie sound'. Some versions say it was lizard-like. In Soviet times and before, the lake was almost inaccessible. Today that is changing. Travel companies in Yakutsk, capital of Yakutia or the Sakha Republic, are already offering private trips to visit the lake, enabling people to carry out their own monster hunts. This perhaps gives an added urgency to Dr Emeliyanova's plans to reach the lake and explore it in a fully scientific way: yet funds, so far not found, are needed to support this venture. She emphasised: 'Apart from the legends about this monster, this lake is quite mysterious itself, for instance distances are hard to measure there. 'Probably it is diffraction of light but still - I mean when you are sailing in a boat and you clearly see the shore is quite far away, in a minute you all over a sudden get there and hit the ground.... One shore is just drift sands. One of the islands on the lake sometimes is not visible, like a mirage in the desert, it comes and goes. 'There is an amazing fact, too, that this lake is never totally frozen, not what you would expect as it is not far from the Pole of Cold. 'But this is the fact, the lake is never fully covered by ice. If it had been fully covered, we could have closed this story about the monster forever. It could not survive. There is also 'an absence of plants there... it is another mystery. While she has conducted no research on it, she said that 'some scientists believe that this lake is connected with other lakes on the same plateau, at least with Lake Vorota, via some underground tunnel system'. Accounts of strange creatures in the lake - often called the 'Labynkyr Devil' - have been passed down from generation to generation. One one version the monster is of dark grey colour with a huge mouth and 'distance between its eyes is just as the size of raft made of ten logs'. The legend says that this animal is aggressive, it can attack people and animals, it can leave the water and go on the shore. A more recent 'sighting' involved a party of geologists some of whom went fishing on the lake. 'Suddenly those in the boat started screaming - apparently they saw a huge head of some creature. Others, who were waiting for them on shore, started shooting, and scared the creature away'. Grasping for mundane theories to explain what the creature might be - if not a leftover from the Jurassic Age that somehow defied both extinction and the Ice Age - some have suggested an abnormally huge and well-fed pike. Yury Gerasimov, head of the Ichthyology Department of the Institute of Biology of Freshwater of the Russian Academy of Sciences, is dubious. 'I have never come across such a big pike and I highly doubt they can exist. 'If we trust the stories about this 'Devil', there must be about 1.5 metres between its eyes. It means the length of its body must be about 7-8 metres. Another Russian traveller Sergei Karpukhin, a former geologist who once spent 35 days alone at Labynkyr, questions two basic premises of the monster theory. If these monsters were to survive down the ages, there must be sufficient of them to reproduce. There would also need to be connections to other lakes, something he disputes. 'A little pack of them, like male/female plus several cubs is not enough,' he said. 'To survive this population must have such a number of animals that the lake would be swarming with them. 'Or at least there should be such number of them, that they would not go unnoticed - given the description of them being quite big, and the lake is not that large. 'I even think that there will need to be more creatures in the neighbouring lakes which the Labynkyr ones can be in contact with. Only then they can survive. 'Now the Labynkyr Devil defenders would, I know, refer to Lake Vorota, some 20 km away from Labynkyr. This is where Tverdokhlybov saw that mysterious creature. Here the legend has some extra bits to it, that allegedly the lakes are connected with some underground canals. I will argue this from a position of a geologist: it is possible to have two connected lakes. BUT, when the lakes of karstic origin. There must be some carbonaceous stones, which can be dissolved by water. Accounts began reaching the outside world after nine geologists led by Viktor Tverdokhlebov, of the East Siberian branch of the Soviet Academy of Sciences, were involved in an expedition to this remote corner of the then USSR in the summer of 1953, a few months after the death of Stalin. As they rode on horseback, their guide was the elderly Varfolomey Vinokurov, a local man. It took eight years his diary account to be published in a Soviet magazine and this referred to his own sighting in Lake Vorota - a name which literally 'Gates' (an unusual name for a lake, perhaps signifying Gates of the Devil?) while also including historical accounts he heard from locals. '30 May. We left Tomtor village, went 70 kilometres up the Kuidusun Valley, turned left and got to the large Sordonnokhskoe plateau. Ahead of us there is Lake Labynkyr where there is storage with food and equipment. 'There are many legends about this Lake Labynkyr. In the evenings sitting by the fire our old guide told us that a 'devil' lived in this lake. He is so big that the distance between his eyes, as Varfolomey said, 'is wider than a fisherman's raft made of ten logs'. 'I heard about this 'devil' before and many times. In Ust-Ner, I heard that the devil ate a dog. The dog swam to bring the shot duck to the hunter, then huge jaws raised from the water and the dog just disappeared in a moment. 'One of the Tomtor villagers told me that one day he found a huge bone on the shore of Lake Labynkyr. It was like the devil's jaw - if you put it vertically, you could ride on a horse through it like under an arch. He said this jaw bone remained near the fishermen house on the shore. 'I heard legends how a whole caravan perished going under the ice of Labynkyr. It was spoken that people saw a big horn stuck out of the ice. People gathered around it on ice and tried to take it out but suddenly the ice broke and many people and reindeer died'. '5 June: Early in the morning we got to the shore of Lake Labynkyr and reached the storage. Comfortable tents with wooden beds and floor and table awaited us. '7 June: We are having a rest. Lake Labynkyr is a square, 15 km long and 3 km wide. I found the ruined fisherman's house on the shore, carefully explored the house and all around it but did not find any 'jaw bone'. He did not witness anything untoward in Labynkyr but went on with his expedition. 28 July: Now we stopped at the shore of Lake Vorota. Mikhail made a raft and went to measure the depth. It is 60 meters as in Labynkyr. But the lake itself is much smaller. 30 July: This is what happened today. It was sunny friendly morning, Boris Bashkatov and I went on a walking trip around Lake Vorota. We had to climb rocks on the way - about 11 am the way became dangerous and we decided to go down a bit, closer to the water. Looking at the water from the rock, I clearly saw a terrace under the water with a huge white spot on it. But when I looked at the terrace again a minute later there was no white spot there. 'Maybe sunshine is joking with me', I thought. But suddenly Boris shouted 'Look! What is there, in the middle?' We stopped. Some 300-400 meters away on the water there was clearly seen some white object, shining under the sunlight. 'A barrel', said Boris, 'made of tin.' 'Maybe a horse got into the lake,' I said. Truly, the object was swimming, and fast enough. It was something alive, some animal. It was making an arch - first along the lake, then right towards us. As it was getting closer, a strange coldness like a stupor was growing inside me. Above the water there was big dark grey body, the white colour has gone. On this dark grey background there were clearly visible two symmetrical light spots looking like eyes and there was just stick in the body - maybe a fin? Or a harpoon of an unlucky fisherman? 'We saw just a part of the animal but we could guess its much bigger, massive body was under the water. We could guess this looking how the monster was moving - raising from the water, it threw its body forward then fully went under the water. At this time the waves were going away from its head, waves originating under the water. 'Flapping its mouth, catching fish', I guessed. The animal was obviously swimming towards us and the waves made by the animal reached our legs. We looked at each other and immediately began to climb up the rock. What if 'it' goes out of the water? We witnessed a predator, no doubt, one of the strongest predators in this world: such indomitable, merciless and some sensible fierceness was in every his movement, in all its looks. 'The animal stopped some 100 meters away from the shore. Suddenly it began to beat against the water, waves went all ways, we could not understand what was going on. Maybe it lasted just a minute and then the animal was gone, dived. It was only then when I thought about a camera. 'We stood for another 10-20 minutes, it was quiet. We went further. 'There was no doubt, we saw the 'devil' - the legendary monster of this area. The Yakut fisherman was right, the animal had dark grey skin and the distance between its eyes was surely not less than a raft of 10 logs. But he saw it in Labynkyr and we saw it in Vorota lake. They are 20 km away from each other - and they are not connected. There is, now, the possibility that the waters of the two lakes are connected by a subterranean channel. For Tverdokhlebov, the sighting reminded him of the killer whales he had seen in the Sea of Okhotsk. In 1945 he had a clone encounter with such a creature when swimming. He also heard more accounts from locals of 'monsters' in lakes on this plateau, which some geologists say maybe of very recent formation. An old fisherman told how he took his net out of Lake Yastrebiny and complaining it was torn, he nodded his head and blamed some animal. 'I did not pay attention then, thinking it was just a big pike,' he wrote. 'I recalled the stories of the workers who saw holes in the ice of Lake Labynkyr and one day they saw some grey body through the hole which disappeared later. Maybe all these stories are not that fantastic, and they are just a chain of real events? 'But if we imagine it is a killer whale, how could it get here? The Sea of Okhotsk is some 300 km away, and the plateau is 1 km above sea level. How would the sea animal survive in fresh water? How did it get here? Is it alone here or is there a whole family? What do they eat? How did they survive the Ice Age? In a book 'Trip to the Cold Pole', author Gennady Borodulin recounts another tale from Labynkyr in the 1920s. 'An Evenk family of nomads followed their reindeer and reached the shore of Lake Labynkyr. They decided to stay overnight on the shore. A five year old child went to the bank of a stream which led into the lake while adults were busy. Suddenly the adults heard the boy screaming. 'The father and grandfather rushed to the bank. They stopped on the edge of water and saw the child being carried away by an unknown animal to the centre of the lake. It was a dark creature, with a mouth looking like bird's beak. It held the child and moved away with quick rushes, then it dived leaving huge waves and dragged the child under the water. 'The granddad swore to revenge the 'devil. He took a sack made of animal skin, stuffed it with reindeer fur, rags, dry grass and pine trees needles, put a smouldering piece of wood inside. He attached the sack to a huge stone on shore with a rope and then threw the sack far into the waters of the lake. 'At night there was noise and splashes and terrible screams of the 'devil'. In the morning the waves brought the huge dead animal, about seven meters long with a huge jaw, almost one third size of the body, and relatively small legs and fins. 'The old man cut the animal's stomach, took out the body of his grandson, and buried him on the bank of the stream. Since then this stream is called 'The Stream of a Child'. Could it have really happened? Only a fully fledged scientific mission can hope to answer whether the Labynkyr Monster is myth or reality. I mentioned in a post from last year that some Nessie hunters thought there was more to the Loch Ness Monster that natural flesh and blood. Indeed, a supernatural or paranormal explanation was courted by some. Ted Holiday and Tony Shiels were two prominent examples but Tim Dinsdale may have been a believer or at worst sympathetic to the argument. Did Tim Dinsdale hold to the view that the Loch Ness Monster was an animal that would naturally and eventually takes its place in the appropriate taxonomic order of phylum, genus and species, etc or was there more to the classification of this entity? He praised Tim Dinsdale, also deceased, not knowing Tim had told me in person, with a witness, that he was a secret paranormalist and kept it quiet just to save his book sales. Another Nessie hunter that eventually had to amend his view was a researcher named Tim Dinsdale. ... The event that convinced him there was an undeniable supernatural element attached to the monster transpired one night while he was anchored just off of Boleskine House, where Crowley performed the Abramelin rituals 70 years prior. According to Dinsdale "he endured a series of ghosts, ghoulies and demons crawling into his boat and coming at him. They never harmed him physically, but they finally killed off the plesiosaur idea for him." Unfortunately, Beckjord's reputation amongst some crypto-researchers was not great due to firstly his obviously fringe views but also his somewhat abrasive nature with other researchers. So it is no surprise that plenty would scoff at these two quotes. Of course, being disdained by others does not mean you are a liar. The identity of the other witness was given by Beckjord himself in his now defunct website www.beckjord.com. However, thanks to the Internet archiving program at archive.org we can access various defunct Nessie websites, including Beckjord's. What he said concerning Dinsdale and the paranormal can be found here during a claimed visit to Tim's house in 1983. 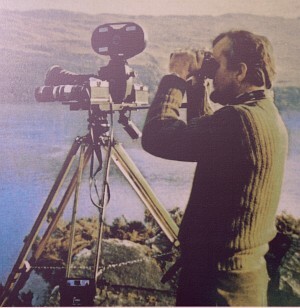 Suffice to say, he claimed Dinsdale did not believe in a normal biological Nessie but hid it since publicly holding such a view could prove to be detrimental to his research and reputation. Beckjord reiterated the ghostly episode near Foyers mentioned above. However, he names the other witness who was his then girlfriend, Kathy Quint, a hospital assistant administrator. Now I suspect Ms Quint resided in Seattle at that time but tracking down such a person now is a major task in the given time I have. I presume, if alive, she would be aged around 70 years of age. If anyone can discover a lead to find whether this person can confirm this story, let me know. In the meantime, Beckjord's story remains in the "unproven" category. In the ﬁeld of the paranormal in recent years science has reluctantly been obliged to admit to the reality of phenomena, which occur, and which are physical in the occurring, and which cannot be explained away in terms of the physics we understand ... It is all very embarrassing, and raises the question ‘what is reality?’. "I hope to maintain a good humoured working relationship and contact between the key figures in the Ness and Morar search and research projects - and other fields of exploration, such as the Bigfoot, UFOs and Paranormal Phenomemon each of which deserves a focus of attention." "Tim was a member of our club, and we met up in Scotland. We became firm friends, and it was he who invited me to join the Ghost Club." "Firstly, that the Loch Ness monster, whichever way one chooses to regard it, really is a phenomenon. Everything connected with it - be it measured in terms of mythology and legend, zoological possibility, scientific improbability, or human involvement - is phenomenal." "Secondly - that beyond the phenomenon, in real terms, there exist the phenomena witnessed by researchers at Loch Ness and Loch Morar, and visitors, and local people, which can be both inexplicable, and "etheric" in lack of substance, but real enough in effect." "The difference between the two is simply the difference between the 'normal' and the 'paranormal' because if the Loch Ness monster exists, for all its extraordinary features, it is as 'normal' a being as is, for example, the mountain gorilla, which for many years before its official discovery was thought to be an imaginary creature. Paranormal happenings, on the other hand, need to be recognised as such, and classified separately - and they may have nothing to do with the monster." Note he does not say "they have nothing to do with the monster". Tim then delves further into these paranormal happenings at Loch Ness and his own experiences. "Over the years I have been careful to collect information on these paranormal happenings, and to record my own experiences which have on occasion been peculiar, and sometimes disturbing. As a serious student of this type of phenomena, both as a member of the College of Psychic Studies and the long-established Ghost Club, and having read widely on the subject, I have become convinced of the need to keep one's feet squarely on the ground - as an engineer should - and thus in recording a few of these happenings, the reader may be assured of a balanced approach to the subject, and a degree of objectivity." When I read those words, I wondered if Tim had collected enough material for another book on Loch Ness, but one of a more nebulous and other worldly nature? And just what were these events described as "disturbing"? Were we approaching Beckjord territory? Without a full disclosure of information we cannot say for sure. "Founded in 1884, the College is a beacon of light and learning for those seeking to explore a consciousness beyond matter." Clearly, Tim Dinsdale was a man who had more than a passing interest in the paranormal. Going back to the article, Tim does record one unusual encounter at Loch Ness around 1975. "Climbing down the steep hillside west of Urquhart Bay at Loch Ness one night about four years ago, I was making my way back to the small research boat, Water Horse, on which I lived. It was swinging at anchor about 30 yards off-shore. There was just enough light to make out the white of the fibreglass hull. Glancing at the hands of my watch I could see they were both exactly at midnight, giving a 'one hand only' impression, which was odd. At that precise moment a strange bluish light seemed to emanate from the ground, about 40 yards ahead of me - for a fraction of a second it lit up the field, and the trees below me at the water's edge. Startled, I halted in my tracks - before continuing down the slope into the eerie gloom, determined not to be put off by ghostly fireworks. A second flash then occurred, from beyond the line of trees, just over the water. There was no one there of course; and when climbing into my inflatable dinghy. I rowed out quickly to Water Horse and scrambled aboard. I could think of no rational explanation for the lights, which unlike summer lightning were blue in colour. Furthermore, they were immediately local - they did not light up the sky, only the field and trees ahead of me. It was a strange experience, and the coincidence of the watch hands directly in line at midnight, equally so." Interestingly, this reminded me of another bluish object that was seen falling near Loch Ness a year or so ago (story here). Tim further adds an experience from Loch Morar when he heard a blood curdling scream echo across the loch one night as he sought a safe haven during a storm at 3 o'clock in the morning. He further mentions the dowsing abilities of an unnamed lady in 1970 (whom we can identify as Winifred Cary) who apparently dowsed over a map of Loch Ness to pinpoint two monster locations for them. Tim goes onto say that they went out to the locations with sonar equipment and registered anomalous hits within 200 yards of her first location and exactly at the second location. So what are we to make of this matter? Did Tim Dinsdale come round to a paranormal view of Nessie or did he always keep stories of Loch Ness Monsters and Loch Ness Paranormalities apart in a state of continual tension? I was once told by a fellow cryptozoologist that Tim Dinsdale's mother was a christian seer and one can presume that some of that supernatural influence must have left an impression on her son. Given all this paranormality in Tim's life, it would indeed seem strange that the Loch Ness Monster was a lone zoological island in a paranormal sea. In fact, based on what I have researched, it would be no surprise to me if it was proven conclusively that he did hold to a paranormal Nessie (whatever that may entail). What seems certain is that Tim Dinsdale did not shut the door on a paranormal Loch Ness Monster and he had tales to tell of Loch Ness which I suspect are now lying in a box or folder somewhere crying out to be told to the world! Sadly, it is probably safe to assume that if such material does exist, it will go the way of other Loch Ness research and never see the light of day again. "While at Ness in 1979 I asked Tim if he thought there was any possibility that the creatures were, as Ted Holiday suggested, paranormal. He said no, but went on to say that he did believe in some paranormal phenomena. One night while moored near Ft Augustus Abbey he'd heard what sounded like a man being flogged, and was sure it was a psychic experience - and that it may have been the sound of someone being tortured there after the '45 rebellion."